Double Pulley Winch Lift System. Four cord rubber torsion axle with independent suspension provides a smooth ride. Easy to use Bearing Lube system provides superior lubrication and long bearing life. Heavy duty steel tube construction. Adjustable bow stops. Adjustable side rollers. Multi-position axle mounts. 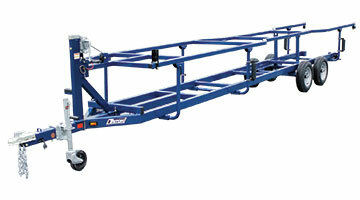 A swivel wheel tongue jack makes it easier to move the trailer off the hitch and also keeps the tongue off the ground. Submersible taillights. Winch stand with steel tube step. Quality 2" coupler with steel safety chains and spring loaded clips for ease of use, strength and safety when you need it the most. Extreme shallow water launching. Multiple tiedown positions to properly secure pontoon. Custom molded wiring harness, routed through the trailer frame, keeps your wiring protected from the elements. Built-in grease zerks on the lift system's hinges.